I wanted to report back to you after an intense week in Paris, where the global community was gathered for the COP21 UN Climate Summit. Firstly, the recent tragic attacks in Paris, California and elsewhere weighed heavily on the week’s proceedings, so that the struggle against climate crisis was embedded in a landscape of terrorism and violence. As global crises of climate, security, the economy, and democracy converge, we must redouble our efforts for transformational solutions to build a world of peace, justice, and human rights. I spoke about some of these solutions at a People’s Climate Summit conference on climate and militarism, which you can read more about here. As the summit progressed and its final outcome took shape, it became clear that COP21 has failed to take the action necessary to prevent global climate catastrophe. The voluntary, unenforceable pledges being produced by COP21 are entirely insufficient to prevent climate crisis. Scientific analysis shows that these pledges will lead us to 3 degrees centigrade global temperature rise – and that will be catastrophic. Some of the pledges being touted as historic agreements could actually result in increases in emission of greenhouse gasses. Plans are adopting deceptive measures of success, such as reductions in the amount of carbon emitted per unit of GDP. Countries are claiming to be making progress when they are not reducing their actual pollution by a single ounce. Mother Nature doesn’t respond to such games. It is the real quantity of pollution that determines whether we will destroy the climate or save it. Despite the seriousness of the threat, some of the major polluters remain committed to protecting the fossil fuel industry rather than taking serious action. I include in that group the United States, where President Obama’s promotion of the hydrofracking industry is leading to a spreading cancer of polluted groundwater and fracked gas pipelines. These pipelines, along with expansion of offshore oil drilling, have to be stopped if we are to make our required contribution to reducing greenhouse gas emissions. The United States and other industrial nations are failing to adequately fund transition and adaptation efforts in developing countries. It is the US and major industrialized countries that are primarily responsible for climate change. We have both a moral and legal responsibility to compensate other countries for the damages we have inflicted, and to enable them to find sustainable paths to development that will raise their standards of living. One area of progress in Paris was growing recognition of the need to limit the global temperature rise to 1.5 degrees centigrade, rather than 2.0 degrees. It is now clear that many countries will experience catastrophic damage from the higher target. Unfortunately, the current agreements won’t even keep global warming below 3 degrees. However, the new international target of 1.5 degrees does provide a tool to push our local, state and national governments to accelerate the transition to 100% clean renewable energy as quickly as possible. I had the honor of speaking to attendees of the Belong Forum in a program that included China’s deputy chief climate negotiator and other leading climate advocates. China has recently reoriented its economic planning to make climate protection a primary goal of its development plans. Also, as a result of its recent election, Canada has a government that is promising more vigorous support for climate protection. The United States also needs to move forward. The United States bears primary responsibility for killing hope for a binding international treaty to avert climate catastrophe. I will return to the United States determined to work to break the grip of the fossil fuel industry on Congress and the White House. Our country must begin to show the leadership the world needs at this critical moment in human history. It’s time for the people of all nations – whose future is being sacrificed by the failure of COP21 – to demand that their leaders live up to their responsibilities for protecting us from climate change. We must insist that the polluting engines of planetary destruction be replaced by the clean, sustainable, just economy that we truly deserve. 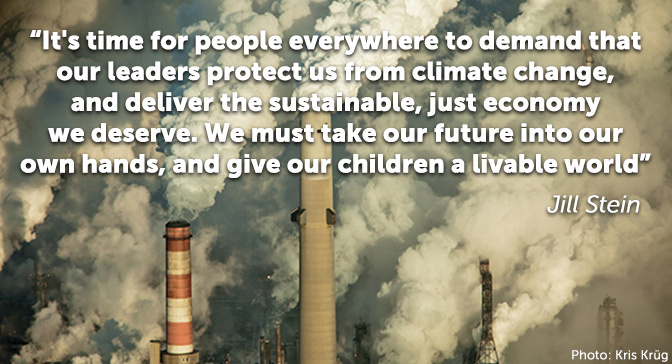 We must take our future into our own hands, and give our children a livable world.